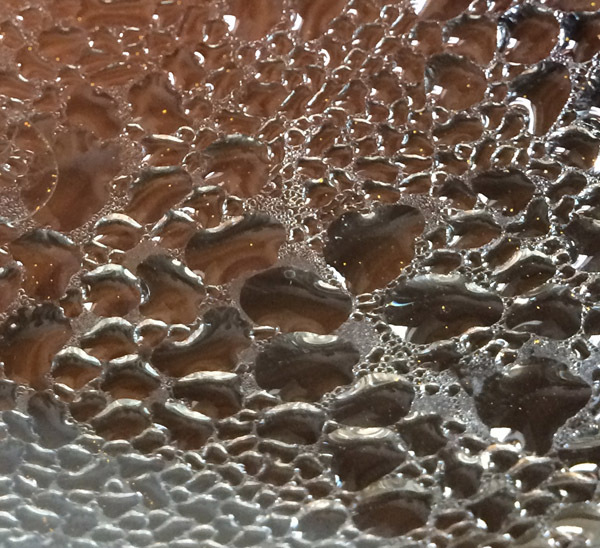 I played the glass-lid-condensation game again. This time I was cooking up rooibos tea dye with some more merino yarn. These patterns of drops mesmerize me so. 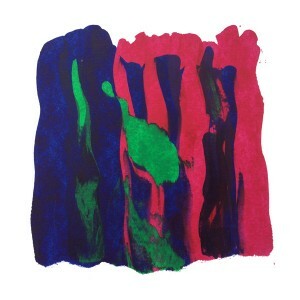 This scraped acrylic painting on matboard had a bright green painted background and an old scrape of paint earlier today. I overscraped some blues and greens and a little transparent white. Some of the ultrabright green ground showed around the perimeter of the scraped painting, and I didn’t like it that much anymore (and the side of the scraper had messed up one of the sides). On my messy art table, I noticed a strip of silk sari material that I had ironed for possible use in a different piece. 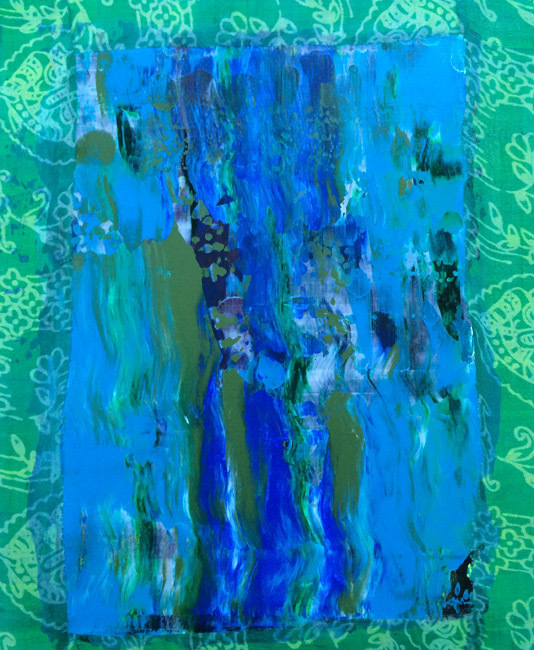 I liked the silk color with this painting: it helped tone down the bright green, as well as added some pattern and framing. It took me a long time to decide which direction this painting is supposed to present itself — and I’m still not sure it’s the “right” way! The other option I was considering was sideways with the dark blue on top. I like both. I was always thinking of it the way it is shown here until I saw it the alternate direction on my computer. This time I’ll stick with my original idea. 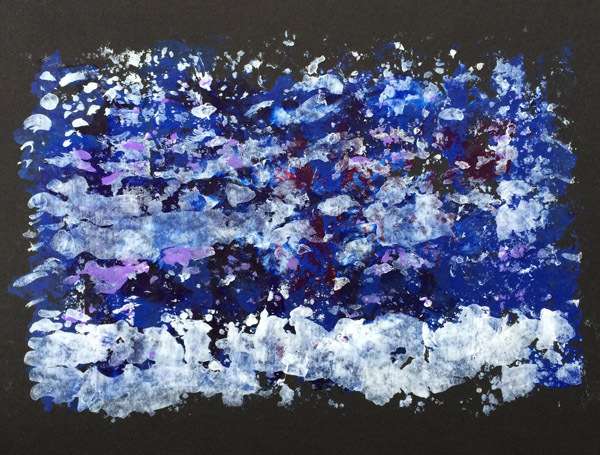 This is the blowing, snowing scene outside my studio window, with some blues and purples in the background for good measure. Spring will come, but not today. Some days it’s difficult to get to the art table. Today was one of those days. Too much computer work. Around 4:30, I ran upstairs to figure out something to make. I found a small piece of matboard, looked at my silk sari “yarn” and tore off some of the strips, ironed the strips and adhered them onto the matboard. I added a little acrylic paint to the bare matboard at the top. And there it is. One might not think that steaming broccoli in a pan with a glass lid would yield a “daily jane” image. I certainly didn’t expect it. 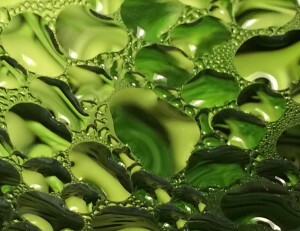 I actually began by shooting some video of the droplets forming and popping, forming and popping. But the reflection of the stove light was too prominent, and I couldn’t get the right angle. With still shots, I could avoid the annoying glare more easily. 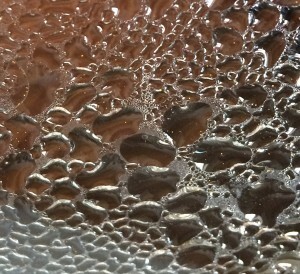 In the past I have taken many photos of condensation droplets on stainless steel lids. The glass lid, though, reveals (however abstractly) the food cooking inside, adding a pop of color that the stainless couldn’t deliver. 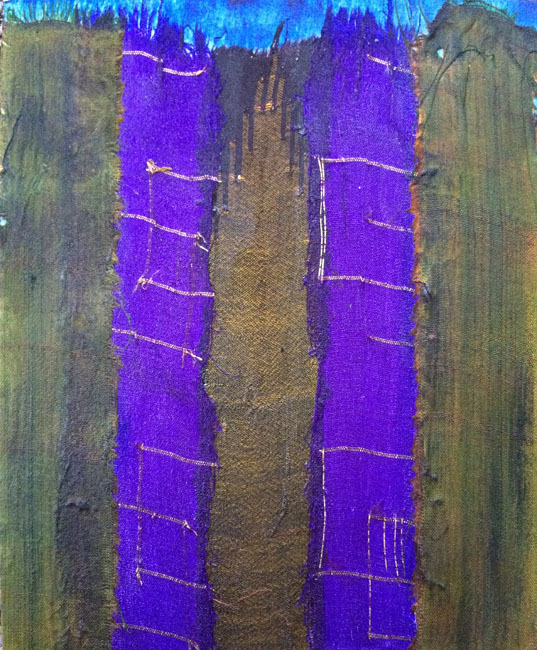 I scraped and pushed around acrylic paint on paper, then dropped and arranged a few threads of silk randomly. 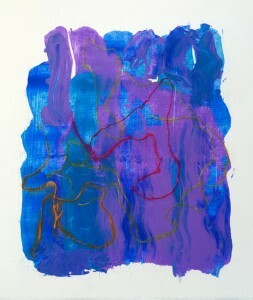 Although some of the thread has disappeared a bit because of the underlying paint color, one image I saw before finally adhering the threads is a woman sitting and lounging in the lower left corner. Not so apparent in this image, but that’s where the title comes from. A few years ago, I worked for a year in an oncology-infusion center in Des Moines as a resident artist (very part-time) where I would offer art-making activities to women while they were getting chemotherapy infusions. Many women were worn out from cumulative chemo side-effects, and many women were just not interested in doing it, and many women said, “Oh, I’m not creative!” I didn’t always have many takers, but some really enjoyed having the distraction and the time to do something different (or something they missed doing). One of the things we would sometimes do is create these Artist-Trading-Card-sized cards (using paint, collage, marker—about anything). I called them Survivor Power Cards. 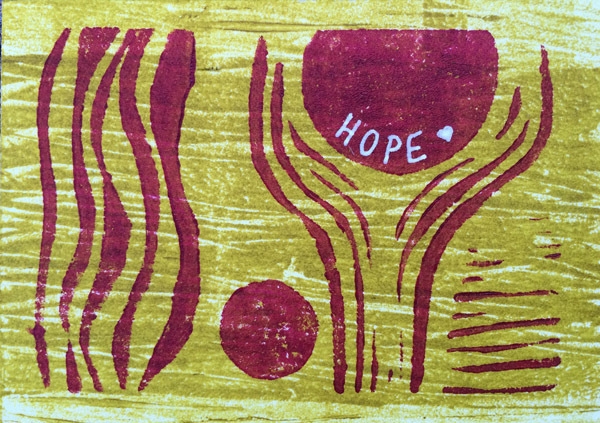 The point was not only to make a card for themselves, but also to make one to leave for others to give them strength or hope or peace. And when I had time (because of no patients or no takers), I would make extra ones and offer patients the opportunity to pick one that most spoke to them. Although the pictured image is a new print, you may recognize the block from a print I posted last month (a dark, plain print). On this new one, I started with some brayer-rolling on the card first, then printed the block over that, then hand-lettered the word “hope.” I will be giving this soon to a friend of mine who just finished several weeks of chemo. Hope is the essence of the Survivor Power Card (and more)! As I was walking outside this afternoon (hazy sunny and 37 degrees—woo hoo! 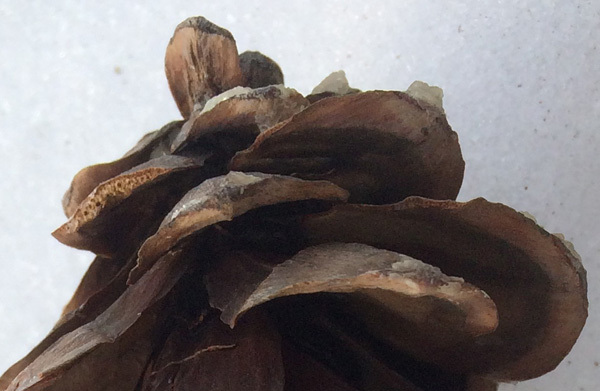 ), a pine cone (several actually) appeared alongside the path. I picked one up and carried it home, where I set it on the snow for a photo shoot. Then I zoomed and cropped on the computer to show a closer view. I like how the cone petals arrange themselves. Nature’s art. 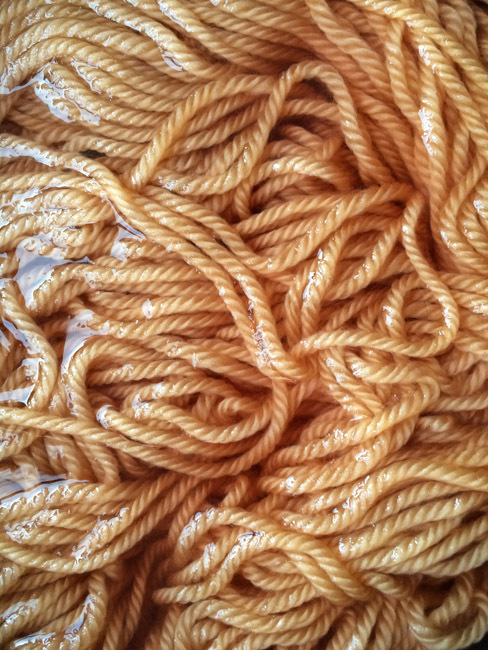 Today I tried a new thing: I dyed some natural merino yarn with some rooibos tea. This photo was taken while the yarn was still steeping in the pot. Last fall I learned how to dye fiber with Jill Beebout at Blue Gate Farm, but we used her bright, bold commercial (not sure that’s the right term) dyes. Since I don’t have any of those dyes on hand (yet), I searched for easier, natural alternatives (and a reminder on the process, because I failed to take notes while working with Jill!). This one looked the most promising, and I followed the “recipe” for the most part. Perhaps I could have let the yarn sit even longer, but it was in there quite awhile. Now the dyed yarn is hanging in the basement to dry, so time will tell, but it’s a nice color so far. You never know, it may turn up in another daily jane someday!